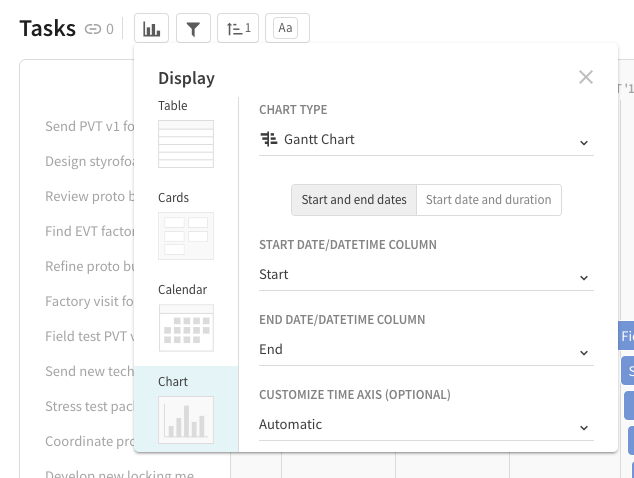 Turn your tables into Gantt charts for tracking, sharing, and summarizing projects. There are times that you may want a visual representation of your tables to update others or track your progress according to time and dependencies. A great way that you can visualize the data in a Coda table is by turning it into a Gantt Chart. 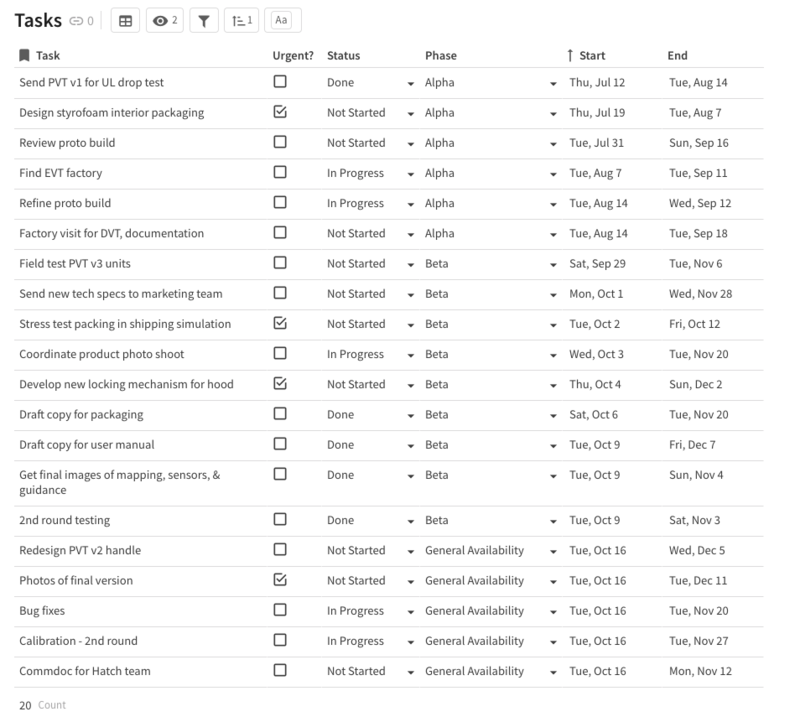 Below, we've built a simple task list for launching a product. We have three phases: Alpha, Beta and General Availability. Each phase has tasks that must be completed within that period, and each task has a start and end date. 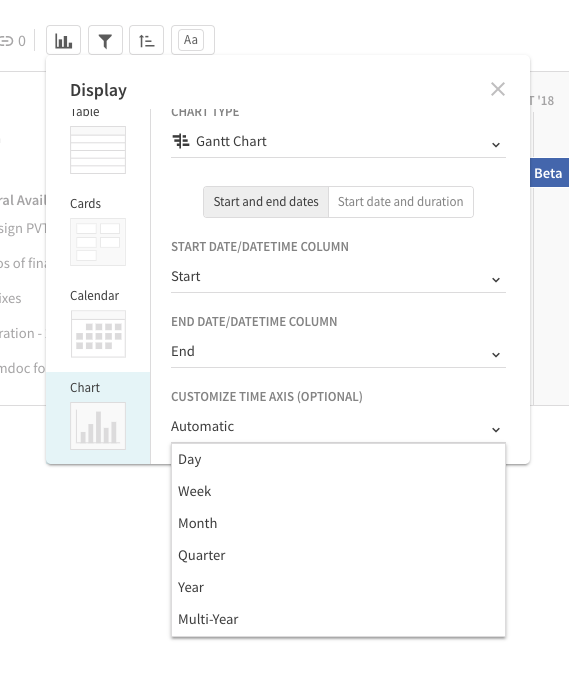 To see this table as a Gantt chart, hover over the table, click the Display button, and select Chart > Gantt Chart from the dropdown menu. This looks good, but maybe we want to see this project by phase instead of each individual task. First, we'll group the phase column to the left. Now, when we select Gantt Chart, we have the option to collapse each phase and see a roll up of our tasks by phase. Pretty sharp! Some of our favorite customization options are hiding/showing the table title, and adjusting the time axis based on the duration of your tasks. Gantt Charts are all about time. So, in order for your Gantt to work properly, you must either select START and END columns, with date formats, or START and DURATION columns. If using duration, make sure you specify days with "days" in the text string. You'll then click the "Customize Gantt Chart" icon once you've toggled to the Gantt layout to select which columns you want to pull dates from.